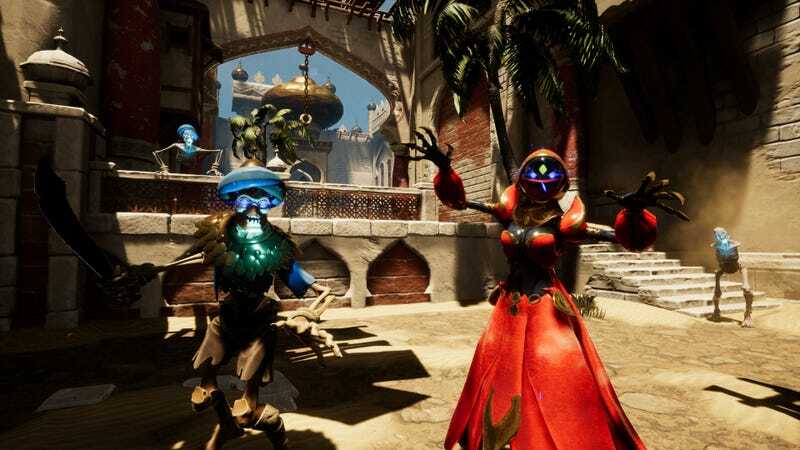 Uppercut Games, the Australian studio founded by a trio of former 2K developers, is taking players to a mysterious new domain in City of Brass, a first-person “rogue-lite” based on famous tales from Middle Eastern folklore. Coming to PC this fall and consoles in 2018, City of Brass casts players as a thief attempting to reach the heart of the legendary city and the treasure it contains. The thief, armed with a whip and a blade, uses these tools creatively to navigate the ever-changing cityscape. Rather than simply hacking things to bits, players are encouraged to kill creatively, using their weapons to trip and manipulate enemies into deadly traps. There’s whipping, swinging, jumping, climbing—it almost sounds like a first-person Prince of Persia with a little Castlevania on the side. Uppercut calls the game a rogue-lite as it features permadeath. Should the player stumble in their journey to the heart of the city, they start over with a new procedurally generated city, using what they learned in their previous life to get closer and closer to the prize. Check out the official City of Brass website for more info.